1. How do I apply for UI benefits? 2. What information do I need to provide when completing my unemployment compensation application? 3. Should I apply for UI benefits right away after I lose my job? 4. How soon may I start collecting benefits after I apply? 5. I was fired without any warning. Does this mean I should apply for unemployment benefits? 6. What is the difference between the “willful misconduct” and the “just cause” standards? 7. What if my employer contests my unemployment claim? 8. I quit my job. Does this mean I cannot collect unemployment benefits? 9. Once I start receiving benefits, what do I have to do to remain eligible to receive benefits? 10. Once I start receiving benefits, what do I have to do to show I’m looking for a new job? 11. I am a union member. How does that affect my unemployment claim? 12. How can I make the best of the system? Each state has its own system for accepting applications. While most states only allow you to apply by telephone or online, some also permit you to apply through the mail. In-person applications have been largely eliminated. Because each state’s application process varies, it is important that you visit your state’s homepage for the most up-to-date requirements. Visit our page on Filing an Unemployment Claim in Your State for more information about how you can file. In a unionized setting, your union may have an unemployment compensation representative or committee that can help you understand the unemployment system in your state. ► the name, address, and phone number of every employer you’ve worked for in the past 18 months, whether full-time, part-time, temporary, or for cash. ► Recent earnings statements, severance pay, vacation and holiday pay, and the date it was paid to you. If you are a federal employee or were released from the military, additional documentation may be required. While you may be able to file a claim for benefits without all of these documents, missing information can delay your first payment. During the application process, you will be asked a series of questions concerning why you left your previous employment. When explaining why you are no longer employed, you should be as clear and concise as possible. For example, state that you misunderstood directions, if you did. If you made a mistake, say so. Inform the office if you tried to avoid the mistake or rule infraction cited by your employer, and how you (or your union) tried to address the situation. Make sure that you inform the unemployment office if you deny the reasons set out by your former employer for your termination. You may also be asked more detailed questions about how you became unemployed by a representative of the unemployment insurance system. It is important to be honest when you answer those questions. UI benefits are routinely audited by state government agencies to ensure proper accordance with federal law. If the government agency determines that you lied or made misrepresentations during your application for UI benefits, you may be penalized up to and including criminal penalties. Most states require that you apply for benefits immediately after you lose your job, as your eligibility begins the week in which you file your claim. Claims start on the Sunday of the week an Unemployment Insurance application is submitted; so begin sooner rather than later. Generally, if you delay in applying for UI benefits, you will not be allowed to receive benefits for the time prior to your application, even if you would have been eligible for benefits during that time. ► You are not eligible for UI because you are not ready, willing, and able to work. For more information, see our site’s unemployment insurance eligibility page. Under current law, all applicants for unemployment compensation must serve a “waiting week.” Since you cannot get benefits for the first week of unemployment that occurs after you file for benefits, you should apply as soon as possible after your job ends–even if you are not certain of your eligibility. Depending on how long you worked before losing your job, you can then collect benefits for up to 26 weeks (which may be further extended under certain circumstances under federal law). Sometimes, but not always, an employer will contest a terminated employee’s eligibility for unemployment compensation. Whether you receive unemployment compensation depends on a number of factors. Yes. You are entitled to compensation if you lost your employment through no fault of your own. However, the states use different standards in determining fault. In many states, the employer will have to prove that an employee was engaged in willful misconduct during his or her employment. If it is shown that the employee engaged in willful misconduct, he or she will be deemed ineligible to receive benefits. In other states, an employer needs to show only that it had “just cause” for terminating an employee. Under the “willful misconduct” standard, an employee who is a poor performer and made many costly mistakes at work would still be entitled to benefits, since his inability to perform the job is not willful misconduct. Under the “just cause” standard, which looks at whether the employer had a good reason to terminate an employee, an employee’s substandard work and errors would provide the employer with cause to fire the employee. Whether your state uses a “just cause” standard or the more lenient “willful misconduct” standard may have a bearing on whether you receive unemployment. A “faultless” termination would involve a company that has downsized and eliminated the employee’s position for economic reasons. In this scenario the employee did not do anything wrong, and there was no “just cause” for the termination. Although the employer may have had a valid business reason for its decision, the individual employee was not at fault and so is entitled to unemployment compensation. Breaking company rules or violating company policy can constitute “willful misconduct” or just cause for termination. Doing personal business on company time, behaving rudely to a customer or client, or failure to show up for work without excuse can all be willful misconduct or just cause for termination. Each case is different. Just because your employer cites some rule violation as the reason for your termination does not necessarily mean that you were fired for “cause” or misconduct, and that you won’t be entitled to unemployment compensation. You have nothing to lose by filing for unemployment benefits and letting the state decide whether to pay your claim or not. You also have appeal rights if the claim is denied, as discussed below. If your employer believes it had good cause to terminate you, it may file a response stating why you should not get benefits. The unemployment office makes an initial determination, usually within a week or two, based on your application and the employer’s response. When your employer challenges your application for unemployment compensation, you should consult the laws of your state to learn the procedural deadlines and other requirements. If the unemployment office determines that you are not entitled to receive benefits, you can appeal that determination. A hearing will then be held, which can be months after the appeal is filed. A Referee will question the parties and witnesses to make a determination on the claimant’s right to benefits. If you show at the hearing that you were fired without good cause, you will be entitled to back benefits, but only for those weeks in which you filed an application for benefits. You may choose to contact an attorney to represent you during the hearing. Before contacting a lawyer, you should consider the cost of retaining legal representation. If you do not expect to receive benefits surpassing lawyers’ fees, you may choose to represent yourself. However, unemployment hearings and appeals can be challenging. For this reason, legal representation can be important, especially if you believe that you were unlawfully terminated and are contemplating a lawsuit. An attorney will help you prepare in advance of the hearing and guide you through the proceeding. process. The hearing can provide a preview of the employer’s defenses to your claim. If you are denied benefits, the attorney can help begin the appeals process. People often believe that when they are initially denied benefits, re-applying every week is useless or unnecessary. This is not true. If you plan to appeal the denial of benefits, you must continue to file requests or applications for benefits and meet all of the other requirements for obtaining benefits. Be sure to pay attention to the deadlines for filing appeals. For more information, see our site’s appealing a denial page. If you quit your job, you are not entitled to unemployment compensation unless you quit for a good cause. “Cause” here means some incident or situation that would lead a reasonable employee in that situation to quit. In most cases, the employer has created an environment that has made employment difficult, such as permanently reducing the employee from full-time to part-time or providing unsafe working conditions. Ordinarily, you must give your employer the opportunity to correct the intolerable condition. Likewise, in a unionized setting, you can seek the assistance of your union in correcting the condition. However, you should still apply for benefits, because the state may agree that you had good cause to quit. In any event, you have nothing to lose by applying. Once you apply for benefits, you will need to periodically certify that you are ready, willing, and able to work in order to continue receiving benefits, and you may need to provide evidence of your job search. 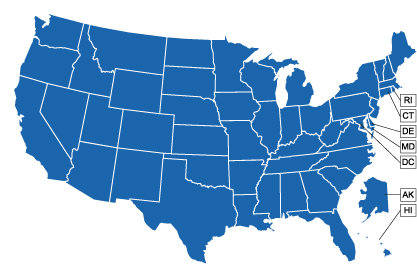 Most states allow for certification by telephone, mail, or Internet. Click on your state in the map at the bottom of this page for a link to certify for UI benefits online. Most states require you to continue following the normal procedures for weekly or biweekly certifying for UI benefits, even if you are not receiving the benefits because the state agency has determined that you are ineligible. If you do not follow the certification process, you may win your appeal on eligibility but not be able to collect the benefits for the time you were challenging the determination. To prove that you are ready, willing, and able to work, you will usually be required to check in with a UI representative to confirm that you are actively looking for work. It is very important to keep track of all of your job search activities including submitting job applications, sending out resumes, and attending job interviews. States will use this information to verify that you have been looking for work. If you receive a job offer of “suitable employment,” you may become ineligible if you refuse the job. While each state’s definition varies, a job is typically considered “suitable” if it is similar to your previous job position, earnings, and requisite training. Where you are subject to a collective bargaining agreement, it may be a good idea for you to pursue through your union a grievance relating to your discharge at the same time as you are pursuing an unemployment compensation claim. Consult your union and your collective bargaining agreement about the filing of a grievance. In a unionized workplace, reinstatement through the grievance-arbitration process may help to establish the absence of fault or just cause. However, while discharged union employees should certainly pursue this option, it may not determine your eligibility for unemployment insurance. ► Know and follow the rules. To receive compensation, you must meet all of the eligibility requirements of the state in which you reside. This means taking care to follow all the proper procedures. Keep copies of all documents you give to the unemployment agency, and request copies of all other documents in your file. ► Fill out the application completely, and correctly. ► Be on time for all appointments. Waiting is better than being told to come back another day, or losing your benefits altogether. ► Look for work. At a minimum, you must make the number of applications required to maintain your eligibility for benefits. However, we encourage you to search diligently for work. ► Keep detailed records of your job search. Record the date, name of the company, how you applied (mail, telephone, or in person), the name of anyone at the company that you spoke with, and whether you received a response to your application. ► Promptly open and read all UI correspondence. Critical information about your rights is often buried in fine print in letters from your state labor agency. Read it closely because there are often short time limits to appeal denials or unfavorable determinations. Keep copies of all documents. You risk losing thousands of dollars in benefits by failing to read the information and abide by program requirements. Judges rarely forgive your failure to open and read your mail. ► Be available for work in your area during the benefit period stipulated in your state. For instance, if you take a week-long vacation, you will not be entitled to unemployment compensation for the week that you were out of the job market. By being out of your regular area of residence, you made yourself “unavailable” for work in your area. ► Be honest. Don’t claim benefits for a week that you are actually working or on vacation. Truthfully explain why you lost your job. If you are discovered to have lied to the unemployment agency, you may be required to repay benefits, you may lose eligibility for future benefits, and in limited cases you may be subject to criminal penalities. Visit our state specific pages on Filing an Unemployment Claim for important information on the process of filing for unemployment in your state. Also, at our site’s listing of state government agencies, you can find the contact information and web links for the agency in your state that oversees the unemployment compensation program in order to obtain further information about the laws in your state concerning unemployment benefits.